Apologies up front as I probably sound like an ornery old fogie. I’m sure you’ve seen lots of hand-wringing press these days highlighting the decline (and possible end) of Pax Americana. Countless newspaper and magazine articles point towards a weaker US in terms of international power and influence. And on the domestic front, we are faced with rising inequality and falling test scores among our students when compared to those in other developed countries (though some argue that US test results aren’t as dismal when socio-economic inequality is accounted for.) And then there are the higher American infant and overall mortality rates among industrialized countries, coupled with our lovely soaring health care costs. Call me a pessimist, but in some aspects, the future just doesn’t look as bright for subsequent generations of good old Americans, does it? Or are the wheels on our proverbial American SUV really all falling off? I can’t speak much to the healthcare conundrum in this country (other than knowing it’s a very big problem,) but I have heard some convincing arguments as to why the US doesn’t necessarily need to produce as much homegrown talent. It’s a matter of immigration. We can easily pinch all the best minds from all over the world because we happen to have specific attractive factors that actually translate to tangible economic innovation and entrepreneurial success: “access to the best immigrants, economic opportunity, and the best research facilities.” Here’s more from the TechCrunch author on why our economy currently seems to get away with it. We do know where some of our best talent comes from: other countries. In some ways, the United States steals its way to economic superiority: it wrangles the world’s brightest minds to immigrate. The U.S. holds roughly 17% of the world’s International students, compared to 2nd-place Britain (~12%) and far more than education powerhouses, Korea, Switzerland, and Sweden (all below 5%). While all of these important arguments about the decline in the American education system take place on a national news stage, I often find myself wondering on an individual level: “Are we all accepting ever lower standards relative to the past?” Usually I’m asking myself this question during some mundane task like scanning the latest cover of US Weekly at the grocery checkout. (In which case the answer is “Yes.”) But I also ask the same question after reading about grade inflation trends or an avoidable SNAFU in the news. So I’m actually kind of curious. It seems like the media wants me to believe that we’re all headed to hell in a hand basket in this country. But are things really that bad? Now I admit that as I’ve aged, I’ve certainly noticed my own mind becoming cloudy (think well-mixed mojito, made with a real muddler,) versus a younger version of my sharper, clear-eyed self (think straight shot of your favorite liquor: clear, intense, but not always the best idea!) With age comes experience, and maybe some wisdom mixed with senility on the side. I guess what I’m trying to say is that I wouldn’t be surprised if I was getting dumber. But I would argue that at some point, a basic standard still must exist in order for our modern society to function properly. Which leads me to a highly anecdotal case study into the steep decline of one specific standard. I’m talking about the evolution (and devolution) of a scam. Now back in the old days as someone growing up in the 80s, I recall getting junk mail and chain letters asking for $5 to be sent to the person whose name was at the top of the list. You were supposed to send $5 to the stranger at the top of the list. Then you’d add your name and address to the bottom of the long list and send the new letter along with the revised list to a few friends as per the letter’s instructions, hoping that the letter gets passed along. This is old-skool scamming. It actually cost the scammer money ($5 + cost of stamps, paper, envelopes, and annoying your friends, etc.) And if all goes according to plan (and of course it never does) one day, you’d be the lucky person at the top of the list to receive hundreds of dollars in the mail from all over the world! Now outside of being $5 poorer, has anyone EVER received anything from these chain letters? You were probably much smarter than me as a kid, and after I learned my initial $5 lesson, I immediately threw away subsequent letters. We live in the age of the Hacker, the Scammer, and the Identity Thief. (Woah, did that last line read like a John Le Carre title to you also?) And often times these days, scammers and spammers spend little to nothing in order to steal people’s private information, whereas before the digital age, there seemed to be a higher hurdle in order to scam others. Now any yahoo with a laptop and an internet connection can easily rip you off. I thought today’s scammers had evolved and had long since moved on from landline and snail mail techniques. But it looks like old skool scam techniques are back in vogue. This week, DH received a letter in the mail. The letter was actually the second letter that we received from the same scammer, as the handwriting on the envelope was identical. The first letter was supposedly from “American Airlines” but the letterhead logo was all wrong and sounded sketchy, so we threw it away without thinking anything of it. This second letter we received this week was similar to the first letter, and came in a hand-written and addressed white envelope containing no return address. And the signee was also the same person, “Amy Dae, Vice President.” But what really shocked me was that there was an actual stamp, postmarked from Phoenix, AZ. Notice anything a little off? Um, like a fictional “US Airlines?” I don’t know about you, but if you were actually going to the trouble of successfully scamming someone by buying stamps and hand addressing blank envelopes, don’t you think you might try a little harder to plagiarize a real and legitimate airline that actually exists rather than making something up? Have our standards fallen so low that lazy scammers who don’t even bother to fact check their scams are successfully stealing innocent people’s information? What bothers me most is that enough people must be falling for the con if the scammers keep sending letters while paying a fortune in postage fees. After I posted my photo up on Facebook, I found around 10 friends living all over the US who also received the same (or a similar) letter. The real US Airways and American Airlines have been in merger talks for months, but it’s interesting that earlier this week, the Department of Justice sought to block the merger due to concerns over competition and antitrust issues. So even the remote chance that the new merged entity would even be called “American Airways” or “US Airlines” or whatever seems unlikely. But now the merger may not go through. 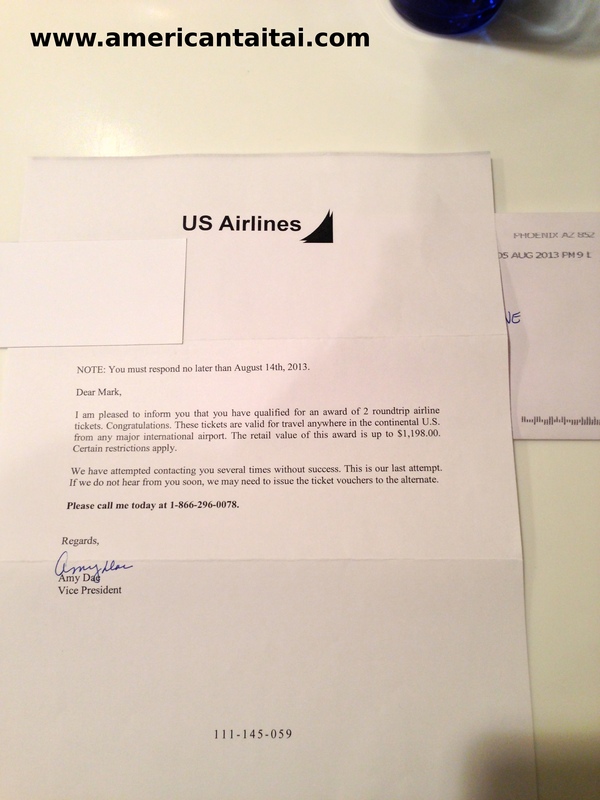 I’m sure it was a coincidence that the merger story broke just a few days after we received our second scam letter from “US Airlines,” but the timing was both hilarious and impeccable. For those of you who received the letter and are curious, this is probably what would have happened if you had called the toll-free number in the letter. Happy Friday to you, and be careful. May you remain vigilant against the world of declining standards, and don’t be fooled by a poorly executed scam. Wow, you get REAL chain letters in the mail?? That’s a first I’ve heard. In a way it seems scarier than the faceless internet scams. I’d say, mail them back all your junk mail – but why waste the postage? Many years ago, I fell for a one of those ‘you are a winner’ messages that popped up on my cell phone. I lost 15 bucks. Embarrassing, but I can live with that. My friend’s parents lost three quarter of a million to an email scam… now that was a whole different magnitude. My friend was livid – she’d told them all along it was a scam, but they would not listen. That airlines thing, lol, so badly thought out! Yes, we’ve all fallen for it one time or another.